Ripertoli is olives-for-oil country and the harvesting of the crop (la raccolta) is taken as seriously by the locals as the wine harvest. Until the terrible winter of 1985, when almost all the olive trees seemed to die, the hills were covered with large trees with a central main trunk. The trees that recovered from this freezing weather re-grew with 4 or 5 smaller trunks around the now-dead old trunk. There are very few original old trees in our part of Tuscany and almost none at Ripertoli. 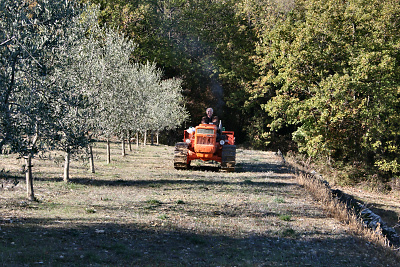 Through neglect over many years the olive terraces at Ripertoli had become over grown and the dry stone walls partially collapsed and became covered in ivy, but in 2005 we decided to reverse this decline and put time and energy into re-creating the olive groves of the past. Firstly we cleared some of the old terraces of the scrub that had grown up – with devastating consequences, as we had failed to get the appropriate permissions and the fines imposed by the Forestale were significant. However, with time we became great friends with the Marshall of the Forestale and with his help and advice we have cleared almost all the back terraces and planted over 300 new olive trees. We now have a total of almost 600, half of which are in decent production. We have employed the second Roberto (Ballini as opposed to Pierazzuoli, who looks after the pool and the grass) and have bought an ancient crawler tractor for him to work the land. It is over 40 years old and the previous owner had been dead for 20 years when we bought it from her which created some minor legal difficulties! So now the olive production is in full swing. 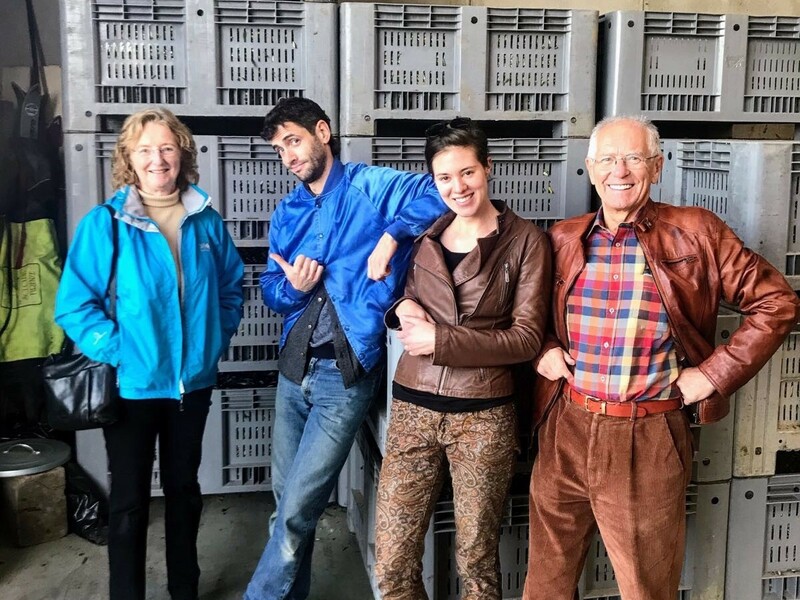 We had a great harvest in 2013 even though the rain prevented us from picking all the fruit. 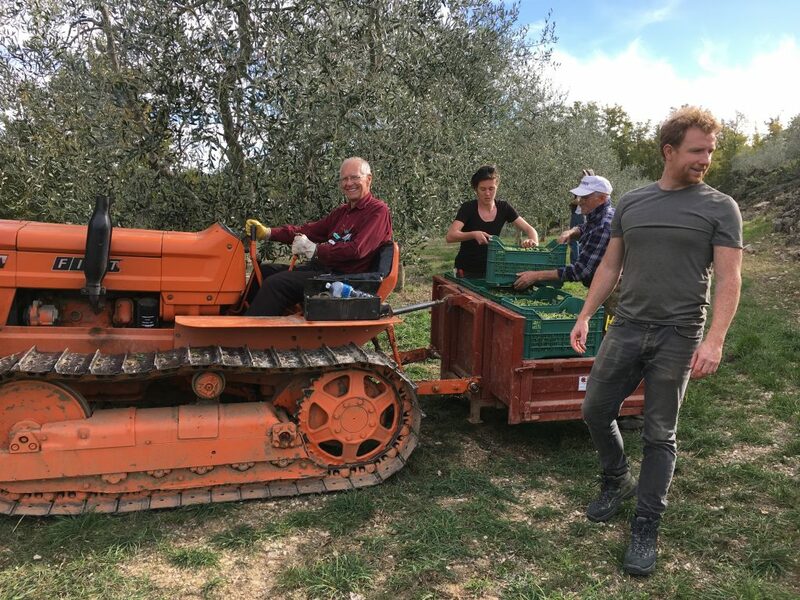 We picked over two and a half tons of olives, with the help of our friends and 2 electric tree shakers, which greatly increase the efficiency of the process. 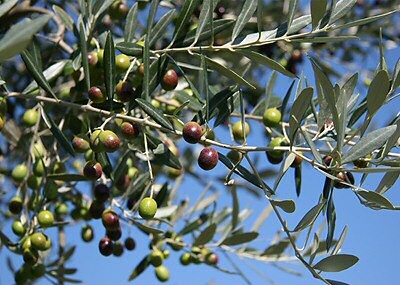 The measure of olive weight is the arcane quintale, which is nothing to do with 5, but is 100kg. In 2013 we picked 25 quintali. 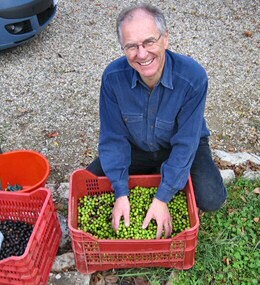 The oil from our olives – cold pressed extra virgin and gloriously spicy and green – was over 340 litres. 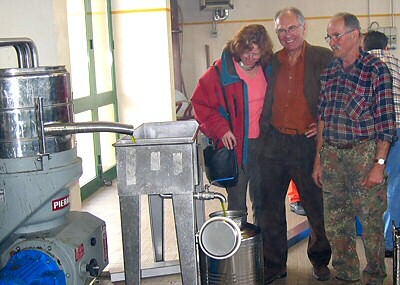 The photos show us taking the crop to the Frantoio (olive-press) and the oil-making process. By contrast 2014 was a disaster ! A plague of “mosche” (flies which laid their eggs inside the olives) struck, and – like the whole of Tuscany – we made no oil at all. 2015 was better but not a great year – the “morellino” trees produced no fruit, and the resulting oil was slightly lighter in texture and taste. The 2016 harvest was record-breaking : three tons of olives, and 420 Kg of superb oil – and 2017 almost equally good, with 2.1 tons of olives and a high % yield so we made 380 Kg of oil of exceptionally high quality. 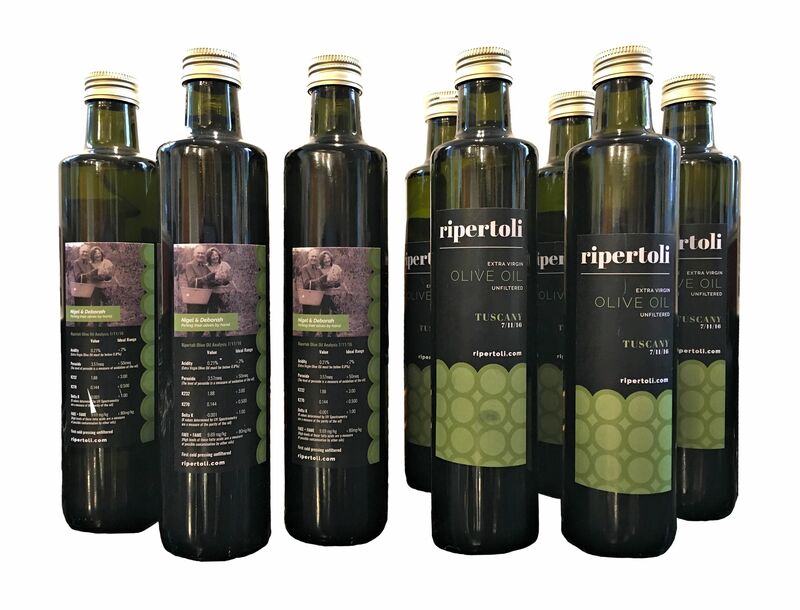 2018 was a step backwards in quantity – 1.2 tons of olives, 211 Kg of oil – but the quality is superb. Here are 2 graphs of our annual production since 2004; the first shows the weight in kilograms of the olives picked & the second shows the total amount of oil we made, again in kilograms. We want our guests to share in the benefit from this extra production, so we will make available as much olive oil as you want throughout your stay. It will live in the metal dispenser by the cooker and all you have to do it turn on the tap! Marisa has been instructed to keep it full. 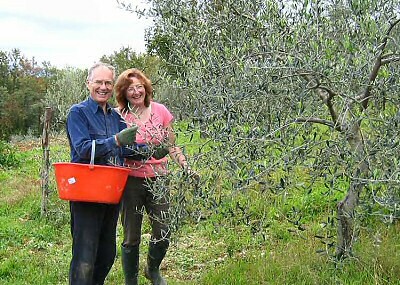 We store most of the olive oil in 50 litre metal containers in the ripostiglio. 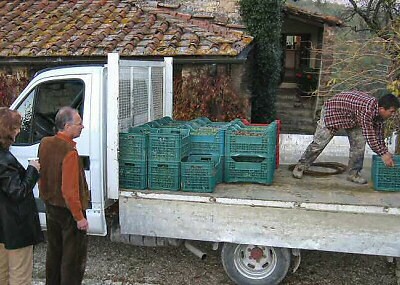 But we also fill up metal 1 and 5 litre containers which are made especially for olive oil with excellent seals. We regularly bring back three 5-litre containers in our checked luggage and have never had a problem. We wrap them in bubble wrap, stuff them in a suit case and off they go. Even Ryanair cannot harm them. So we will give you a 1 litre can of oil to take home. The bubble wrap is in the ripostiglio. Oh and if you want to buy more Marisa will sort that out for you, or we can ship it to your home in our smart half-litre bottles; we have happy customers in Alabama, New York and Scotland ! 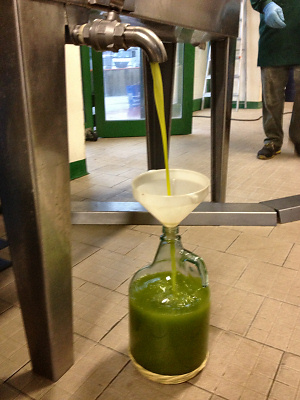 Ripertoli extra virgin olive oil 2012 emerging from the press. Making oil at Ripertoli is great fun, and like all our neighbours we know that ours is the best in Tuscany, if not the world. We hope you will enjoy it too. Lots of people ask what the definition of Extra Virgin is. It’s simple – less than 0.8 per cent acidity, cold-pressed and then centrifuged once only, with no chemicals used. Really good oils end up being much lower acidity even than that – ours is usually 0.1 or 0.2 per cent acidity. Click this pdf icon to see the chemical analysis of our 2017 oil : 0.21 % acidity, a quarter of what’s allowed! 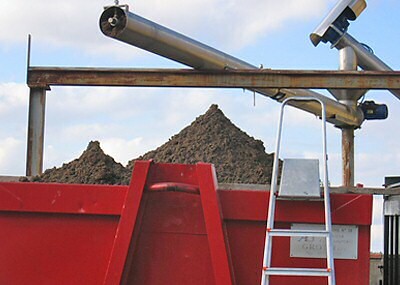 If you want to know what ordinary olive oil is made from, take a look at the photo of the brown leftovers in the red container outside the Frantoio – this gets taken off to a much nastier place where it is treated with heat and chemicals to extract the last bit of sell-able oil. Not like ours!